Made from chopped up newspaper, wood fibers or a blend of materials. Helps keep the seed moist and promotes fast germination. High performance products are also available. Most any seed that can be planted by seed can be hydro seeded. That includes most grass seeds, wild flowers, erosion control mixes, athletic field mixes and native grasses. 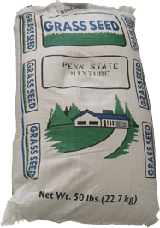 Fertilizer helps promote germination and helps the new seedlings grow faster and healthier. Most any fertilizer can be used including granular, water soluable and liquid. Tackifier works like glue to help hold materials in place when it rains. Tackifier will also lubricate the mix making it slippery, eleminating clogs and allowing you to spray a thicker slurry. 100% Paper Mulch. This is made from chopped up newspaper with a blue/green dye. It comes in bales wrapped in plastic in 30, 40 & 50 pound sizes. It performs very well and is the best choice for jet agitated hydro seeders. The heavier the bale the more it is compacted. Lighter bales are easier to add to a jet unit than heavier bales because they are more loosely packed. 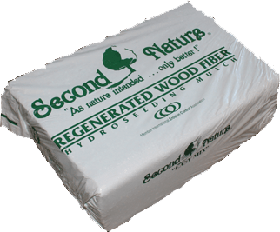 Paper mulch combines high performance with a low price and is a great choice. Pourable Mulch. These may be a combination of paper and corn or paper and wood. They are ideal for smaller jet machines that have smaller openings. These mulches are basically flakes or pellets that can be poured right into the machine in seconds with no spillage. Pourable mulches are made by two companies. Profile Products which sells their mulch under the name “Cover Grow” and “Seed Aide” and by Phoenix Paper who sells their mulch under the name EZ Mulch AF. Wood Mulches. These mulches are made from wood byproducts and one of the advantages is that wood mulches retain more water than paper mulch. However they also take longer to absorb water so loads must mix for a longer time. 100% wood mulches are not recommended for use in any jet machine. Wood mulches tend to float more and when the tank gets low the water can leach out of the mulch leaving a thick layer of mulch at the bottom of the tank. There are also mulches that are part paper and part wood. Blended mulches that are 50-50 can be used in jet units 300 gallons and larger and some 70-30 mulches can be used in those jet units. However with any hydroseeder when using a wood mulch it is important to flush out the unit when you are done spraying. Wood mulch will absorb water for some time and swell as it does that so if it sits too long clogs are likely in any machine. Turbo Turf’s HARV and T series units can spray wood mulches. High Performance Mulch. For severe erosion control jobs there are many high performance mulches available. These often have names like BFM’s (Bonded Fiber Matrix) or FGM’s (Flexible Growth Media). Most are basically wood mulch with additives that make them stick even better. They are expensive (3 to 4 times the price of paper mulch) and must be applied heavily (often at 3000 to 4000 pounds per acre) One of the most popular high performance mulch at this time is Flexterra but there are many choices of products that work well. Flexterra and other high performance mulches can be sprayed with Turbo Turf’s HARV and T series units. Most any seed can be used in a hydroseeder. This includes any grass seed, wildflowers, erosion control seeds such as crown vetch and birdsfoot treefoil. There are some grasses for which there is no commercially available seed such as St Augustine. Among grass seeds commonly hydroseeded are blue grass, fescue, rye grasses, Bermuda, Bahia, centipede, native grasses, wild flowers and more. 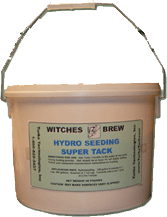 Hydro seeding does not require special seeds. With most hydroseeders you can use any fertilizer you wish. That includes granular, water soluble and liquid. We do not recommend Agricultural Fertilizer. When hydroseeding we prefer a high phosphorus starter fertilizer but many like a balanced fertilizer such as a 19-19-19. Keep in mind the higher the numbers the less filler is in the fertilizer. Nitrogen is very corrosive. With a hydroseeder with a metal tank some operators prefer to spread the fertilizer as a second step and apply it with a fertilizer spreader. This is usually not a concern when using a hydroseeder with a poly tank. Hydro seeding tackifers accomplish two things. They will work like a glue to hold the mulch and seed in place in the case of rains, even heavy rains. They also lubricate the system and make it slippery. This allows operators to use more mulch in each load and helps minimize any chance of clogs in a hydroseeder. Among the products that tackifier is made from are polyacrylamide which is usually applied at 3 pounds to the acre and is easy to store and inexpensive and Guar which is made from the gum of the Guar tree. Guar is usually applied at about 30 pounds to the acre. CO-POLYMER GEL Co-Polymer Gel will hold 400 times its weight in water and slowly release it into the seed bed. 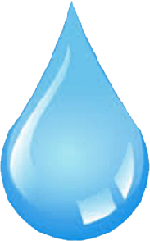 It can reduce watering requirements by 50%. This is one of the optional products that we really like and is ideal for jobs that won’t be watered. BIO-STIMULANTS There are lots of natural additives available to help the seed germinate and to help make the grass plants healthier. Many people like to add these to their mix to make sure they get the best lawn possible. HERBICIDES There are some herbicides that can be added to the hydro seeding mix to minimize the competition from weeds in the new lawn. One popular one that can be added in the hydroseeding mix is “Drive”. It will however reduce the germination rate of any Kentucky Bluegrass in the blend by about 25% so if that grass is in the mix operators should add extra seed to compensate for the decreased germination rate. Using a herbicide in your mix may require that you have an applicators licence so check with your state requirements. LIME We don’t recommend the use of lime in a hydroseeder. Microscopically the molecules for lime are very hard and very sharp and can cause excessive pump wear. We suggest applying lime separately however options that are more acceptable is Liquid Lime or Profile’s Nutra-Lime dry. Both are highly concentrated and one gallon of liquid lime will produce the same results as 1340 pounds of ag lime and will accomplish that faster. SPRAY ON TOPSOIL One of the newest products that we hear good reports on but have no first hand experience is a topsoil replacement that can be sprayed right on the job site and provides a better growth media than topsoil. This is particularly good for steep slopes where applying topsoil is difficult. One of these product is “ProGanics” which is made by profile products and another is Biotic Earth. Depending on tank size one load of these products can replace 1 to 3 truckloads of topsoil. With our units we would recommend a T series or Harv Series unit to apply it but it may be possible to use a jet machine 300 gallons or larger.